Books of poetry aren’t always collections. They can come in other forms. One of my favorite forms of poetry in recent years is the verse novel. I’ve read a number of them and continue to discover them. To keep it simple, for those who haven’t heard me talk about them in the past, a verse novel is just what it sounds like: A novel written in verse. The same full arc of a novel is told, but instead of pages filled with words, sentences, ideas, etc (prose), the author uses the shorter, more exact form of poetry to tell the story. Today, and maybe later in the month, I’d like to share a review of one of my favorite verse novels so far. I read this awhile back, but my opinions of it are still the same. It’s a book by Sonya Sones, called Stop Pretending: What Happened When My Big Sister Went Crazy. Sones have a number of other verse novels out, so be sure to take a look at all her work. I’ve read all but one so far and enjoyed them! “It happens just like that, in the blink of an eye. An older sister has a mental breakdown and has to be hospitalized. A younger sister is left behind to cope with a family torn apart by grief and friends who turn their backs on her. But worst of all is the loss of her big sister, her confidante, her best friend. Sonya Sones grew to be one of my (recent) favorite authors after I read What My Mother Doesn’t Know, and soon after, What My Girlfriend Doesn’t Know. I went out and bought all her books after I read those two. But what I didn’t expect is that Stop Pretending, Sones’ first book, is an even better book than those that came after it. Sones’ free-verse novel, Stop Pretending, does two amazing things that I haven’t witnessed in other free-verse novels so far. A majority of this book’s poems can be read separately from the others. They stand alone as very powerful works of poetry and don’t need the support of the “larger story.” At the same time, they all mesh together into that “larger story” that is hard to step away from, even with it being an emotional read. It’s the combination of these two effects that makes Sones such a great novelist and poet, all in the same work. Being that this is strongly influenced by the author’s life growing up, I feel that it helped her create the very real main character. 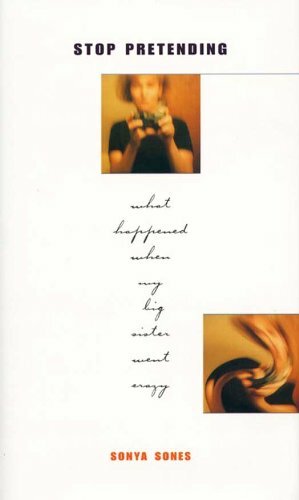 The poems bring the reader deep into the mind of this teenager who doesn’t know how to deal with her sister’s hospitalization. This can only come from someone who’s dealt with similar issues in real life. It also allows a reader, and even society in general, to consider all sides of the situation. It’s not just the patient who needs therapy, or just someone to talk to in general. It’s all members of a family, no matter how much they try to hide it. Sonya Sones’ first book is by far my favorite of hers so far. It’s no wonder her books have gotten the attention they have. Sonya Sones is an American poet and author. She has written four young adult novels in verse, as well as a novel in verse for adults and a picture book. This entry was posted in Poetry Month and tagged Bell Jar, Coping, disorder, Free Verse Novel, Free-Verse, I Never Promised You A Rose Garden, manic, mental breakdown, National Poetry Month, novel, poem, poems, Poet, poetry, Poetry Month, Review, Sonya Sones, Stop Pretending, What Happened When My Big Sister Went Crazy. Bookmark the permalink.